Scratch built in wood with a thin sheet metal overlay, following an article about the prototype cars in a 1942 issue of Railway Age. Weathering was done with light sprays and thinned washes of Floquil weathering colors. The extra solvent in them also allowed the decal inks to streak. Need to replace the plastic wheelsets with weatherd metal, which will look much better. 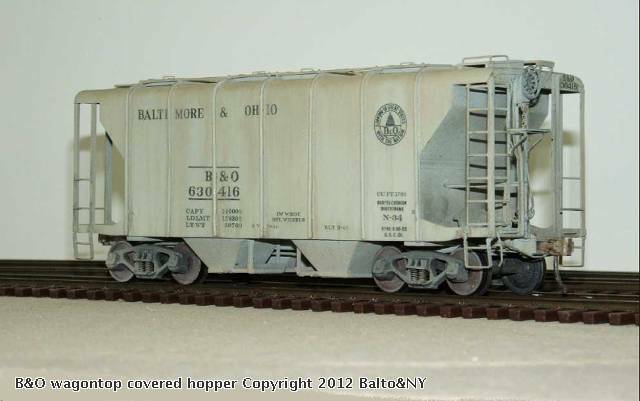 B&O built only 200 of these wagontop covered hoppers built in 1942. Some were assigned to specific shoppers to carry certain commodities related to glass making and oil well drilling. Others in general service usually hauled bulk cememt.